The latest creation of Pragmatic Play is available at Vegas Spins! Want to try it? 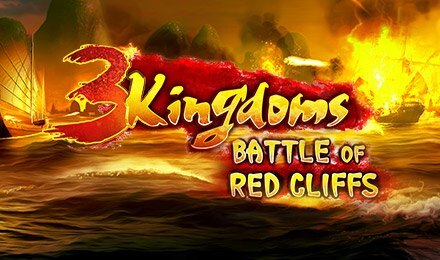 Roll the reels of 3 Kingdom Battle of Red Cliffs slots. Made with 5 reels and 25 paylines, this slot game will take you into Ancient China. On the sea background, you can meet the three legendary warriors which can help you with your quest for winnings! Find the regular card values like 9, 10, J, Q, K and A on the reels of this slot game. High-paying symbols you will discover are Cao Cao, Liu Bei, Sun Quan, Swords and Ships! Keep an eye on the warriors as they award 200 coins each time they land on the reels. There are different play options on the display of this slot game. By clicking on the Auto-Play option, you can have from 10 to 1000 game rounds to be played on their own, without any required manual intervention. Bet Levels: The bet levels you can choose from range between 1 to 10. Amount of Paylines Selection: You cannot adjust the paylines as these are fixed. Coin Values: You can choose any stakes which range from £0.01 to £0.50. Vanity: 20 free spins where red warriors are wild on reels 2, 3, 4 and 5. Intrigue: 10 free spins where red and green warriors act as wild. All Out of War: 5 free spins where any warrior symbol is wild when seen on reels 2, 3, 4 and 5 only. Spoils of War Progressive Jackpot Feature:Whenever any of the three warrior symbols are seen on the reels, you are given 1 point. And, once you have a total of 40 points, the jackpot is automatically launched. You will be facing a few envelopes which can reveal from 4x to 100x your total bet. Make the right choice! Anytime you are on for a good fight, you can enjoy this warrior themed slot game!